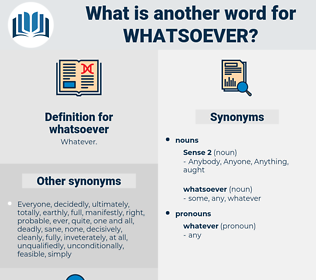 What is another word for whatsoever? 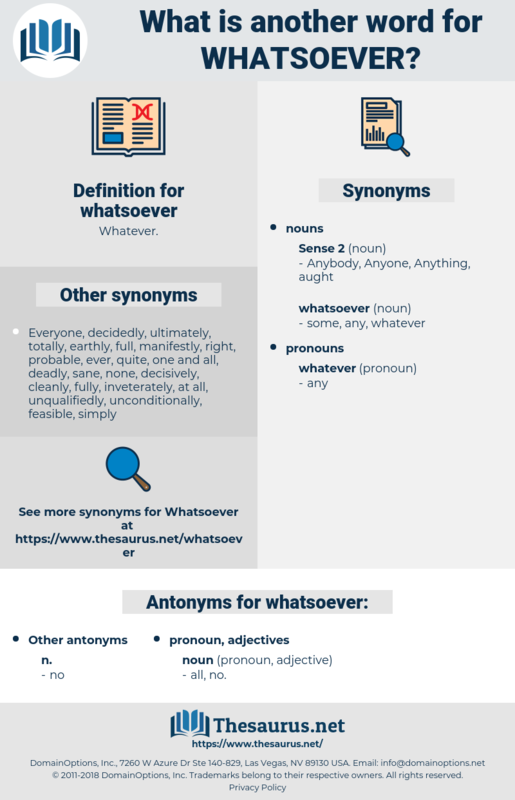 absolutely, totally, altogether, any, completely, either, entirely, no, utterly, regardless, definitely, certainly, wholly, type, anywhere, somehow, perfectly, wholeheartedly, never, quite, irrespective, nowhere, really, categorically, else, anyway, exactly, somewhat, hardly. He showed no recognition of me whatsoever. She felt that she could safely owe him any debt of gratitude, however great, while he, on his part, took what I fancied, both then and afterward, were unnecessary pains to assure her that, in the event of his finding the assassin, she need have no fear of his making any claim whatsoever upon her.